Boca de Yuma is a village in the province of La Altagracia. It is situated west of the mouth of the Rio Yuma, near the Caribbean Sea. The word Yuma is an indigenous Taíno name. The village has a pleasant climate. It is peaceful and tranquil. A few miles west of the village is the Del Este National Park, one of the largest national parks in the country, with an area of 310 square kilometers. The bay of Boca de Yuma is used for fishing and boat trips. In 2008 the population was about 2,400 people. This hidden paradise and privileged remains a humble village surrounded by beautiful beaches and generosity of his peoples. It is a town of simple individuals, and modest worker. Boca de Yuma is within short distance of La Altagracia province, one-hour drive from Punta Cana, thirty minutes from La Romana city and an hour thirty minutes from the capital city. If you ever step a foot in Boca de Yuma you will be wrap by numerous attractions, for example hunting, fishing, hiking, biking, photography, beaches, caves and national park. The national park is home of different species of birds and animals of the region. 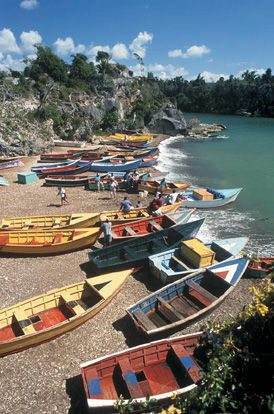 A navigable river of 1.5 km in length, which if you travel by boat up the river it reveals the beautiful landscapes and the caves where according to tradition the pirate Roberto Cofresí took refugee and hid his treasure.